what's this about the Audit Commission - some may say finally - threatening legal action against jolly old STC? I understand there was a special, or is it extrordinary, meeting? Are you sworn to secrecy? Thanks to everybody who has asked about the future of the blues festivals. I have on-going problems with my old computer and have been unable to get everything sorted as I usually do. "Swanage, Dorset, is a small British seaside town which has, like most British seaside towns seen better days, but in Swanage they make a feature of their past." Use a closed school as a school! Sticklands the butcher will apparantly close on August 23rd. How sad. Thanks to everybody who's asked about the new Local Food and World Music Festival proposed for June 2009, and the new website Swanage Life that will be supporting it. Plans for both festival and website are temporarily on hold while I raise funds for the existing blues festivals in March and October. 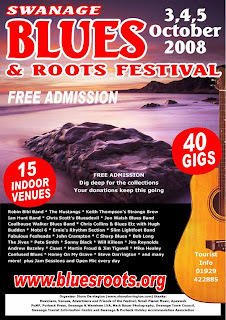 Since each existing blues festival brings £136,000 extra business into town - twice a year and out-of-season - I feel I should work on the survival of these festivals at the moment, rather than embark on new projects.